McCary Jewelers Inc. | Making the moment a memory for life. McCary’s Jewelers is a four-generation family jeweler established as a leading source for highly regarded jewelry, stones and unique specialty, custom designs. 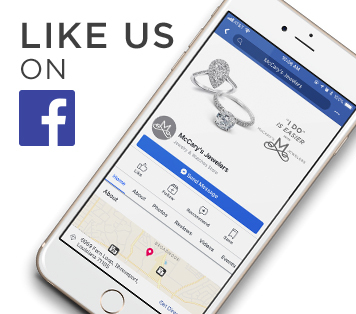 McCary’s Jewelers has a 75-year history in the Shreveport-Bossier City area and has built a long-standing reputation for quality everything – jewelry, service and people. A history of successes have leveraged the jeweler into a NEW location, the first custom-built stand-alone building for the family business located on prime real estate property just off E. 70th Street – a thriving corridor of local and renowned retail establishments. The NEW McCary’s Jewelers is fashioned to impress in an atmosphere that speaks to the standard upheld in every part of the business. The family patterned the location after the finest jewelers in the United States, focusing on the customer experience for details, style lighting, and product display – the finer things that make the customer confident they have chosen the right jeweler. As an American Gem Society store, McCary’s is one of the only local jewelers to employ professional registered and master jewelers, as well as certified gemologist appraisers and jewelry consultants. With this expertise, and passion for fashion and fine jewels, the shopping experience is elevated like no other in the market. McCary’s Jewelers is a brand ambassador of a special collection of designers including Alwand Vahan, Simon G, Gabriel & Son, Raymond Weil, among others.